Michelle Mah photo by Food Fashionista. While at the Meals On Wheels Star Chefs event on Sunday, I had a chance to intercept chef Charles Phan, fresh off his James Beard induction into the lineup of Who’s Who of Food and Beverage in America. I asked him about his plans for chef Grace Nguyen’s replacement at Out the Door Bush, and he said they are going to just manage it internally, and promote from within as necessary. The bigger news, however, is that he has brought on Michelle Mah to his team. Mah just started yesterday, and will be working to understand Phan’s systems and doing some menu development at the commissary. Phan is being tight-lipped about the upcoming Valencia Street restaurant, but he did mention there is a hearing on the 19th, so I expect to have more details after that. (One can make some guesses with these two pieces of news….) There was also a tweet mentioning Phan’s potential expansion to New York in 2012—hopefully more on that soon as well. 584 Valencia St. at 17th St. The transformation from Bambuddha Lounge into the spiffy ~CHAMBERS EAT + DRINK~ is now complete: Sean and Isabel Manchester’s groovy new bar and restaurant opens tonight for business. Chef Trevor Ogden (Mission Beach Cafe) has crafted a menu that’s a bit gastro-pubby, with some California seasonality, and a bit of Asian flair in a few dishes. Dishes on the opening menu include 13 small bites, like artichoke hearts ($9) with baby beets, Meyer lemon, olive oil, garlic, mache, sunchokes; and braised pork croquettes ($13) with mustard emulsion, smoked grits, baby greens, apple jus. A few dishes that show more Asian inspiration include the P.B.L.T. ($10), crispy braised pork belly, baby romaine, and heirloom tomato, rice paper roll, house sambal, and Champagne aioli. Larger plates include suzuki bass ($25), beech mushrooms, baby bok choy, ramps, potato noodles, hot and sour consommé, pink peppercorn; and smoked beef short rib ($18)—there’s also a Prather Ranch burger on a challah bun with fries for $12. The full menu will be served until 11pm, with a smaller bar menu until 1am or 1:30am (TBD). Cocktails were designed to be quickly executed and simple, like a Paloma, Martinez, and Blood and Sand, all for $10—there’s a list of 10 specialty cocktails in all. The space looks aaaamaaaaazing (Sean Manchester worked with Charles Doell of Mister Important Design); look at my last piece for descriptions of the décor, and Grub Street has this nice slideshow of the interior and the patio. And check out the vinyl count: 7,000 LPs are lining the shelves, and they’re collecting another 2,000 more. The music will be rock-influenced (like the look of the place), spanning classic to indie. Please note that even though Chambers is open tonight and Wednesday, starting Thursday, it will actually be closed to the public for the kick-off of ArtPad, a three-day event at the hotel and restaurant. So your best bet is to visit starting next Tuesday May 24th, when they will be able to run their regular hours. Can’t wait. Let’s rock. Time to practice your Basque Xs, because Ryan Maxey and Ian Begg (Naked Lunch) are opening their San Sebastián-inspired restaurant, ~TXOKO~. To begin, here’s how you say it: like tchotchke, just add a little “T” to the word choke, tchoke-oh. Okay, now that you’ve got that down and are ready to start drinking some Txakoli, here’s what is on Begg’s sample menu: there will be a variety of small bites (pintxos) for $3-$7, like oysters, fava bean cuscurro (crostino), and a Roncal cheese croqueta; slightly larger small plates include crispy Chesapeake Bay soft shell crab ($12) with piquillo pepper purée, bacon, spring onions, herbs, crispy sweetbreads ($10), and grilled octopus ($8) with potato pearls, sea beans, ramps, and truffle foam. Bigger plates include oven-roasted suckling pig ($32) with spaetzle, Madeira, yam purée, and mustard greens, and rex sole a la plancha ($25), with summer squash and potatoes. There will also be a cheese selection, and dessert includes gâteau basque ($6) and foie gras ice cream ($8) from these foie-loving dudes. More on the history tip: the Enrico’s space has been transformed from a live music venue into more of a “Basque-style tavern with a modern twist.” Urban Chalet is behind the redesign, and local artist Jeremy Fish did the mural (along with their logo). They added a communal table, and there’s a spacious bar area, plus both indoor and outdoor seating (45 and 35, respectively). I’ll have more details and some pics in a couple weeks. The Next Proxy Container Opens This Saturday: Ritual! The (almost complete) Ritual Proxy container. Photo by Eileen Hassi. After Smitten, the next in line to open in the Hayes Valley Proxy series is ~RITUAL COFFEE ROASTERS~ this Saturday May 21st. They will continue to offer their small lots of high-quality coffees that they source directly from coffee producers. Coffee will be brewed on the v60 bar, with three on offer at any given time. The espresso program will feature their seasonal blend as well as a single origin, which changes monthly. There will also be special treats from Sandbox Bakery and Black Jet Bakery, plus a really nice tea menu featuring Red Blossom teas. Hours will be 7am-7pm. (Please note this picture is not of the finished container.) 432 Octavia St., No. 1b, at Linden. A tablehopper reader on their way to work in SoMa told me they spotted a sign stating “~TURTLE TOWER~ Coming Soon” on 6th Street. Further details can be found on LiveSOMA, with the owners writing in to say they are hoping for a June 1st opening. That is pho-king awesome. 501 6th St. at Bryant. The chairs at Mirtille (photo from Facebook). Not too long ago, I mentioned a new café opening in the Civic Center/Tenderloin area: ~MIRTILLE~. Well, the 26-seat café with the blueberry-inspired palette (mirtille is French for blueberry) should be opening this Wednesday or Thursday from owners François and Isabelle Chevillotte. To recap, they will be serving healthy and flavorful food with local and seasonal ingredients, including fresh salads (there’s a salad bar), sandwiches on house-baked bread, and being French, some pastries and coffee will also be offered (they are using Mr. Espresso). See the full menu here. They are also planning for eventual outdoor seating. Hours will be 7am-7pm daily. 87 McAllister St. at Leavenworth, 415-252-7661. Photo by Rick Camargo Photography. Over at ~MISSION BEACH CAFE~, chef Ron Silverberg had to unfortunately attend to a family matter in Pennsylvania, and had to leave the restaurant. Owner Bill Clarke is welcoming back chef Thomas Martinez, who started this week and is working on creating his own menu with his team; Thomas left in 2009 to pursue farming up in the Healdsburg area with Timothy Holt (Weird Fish) at Roshambo Farms and some freelance chef gigs. One more thing to note: starting on Tuesday May 31st, MBC will be re-launching their annual “BBQ Tuesdays” menu. Stand by! Based on this posting on Craigslist, it appears ~LUNA PARK~ is looking for a new executive chef; Ronnie New is leaving in two weeks, and will be working as a line cook at Contigo, and picking up shifts at Living Room Events/Kitchenette. 694 Valencia St. at 18th St., 415-553-8584. And over at ~NOMBE~, chef Vincent Schofield has departed, and owner Mari Takahashi is now serving as executive chef. She has brought on chef de cuisine Pierre Mangé (Zero Zero, SPQR, Contigo)—I mean, come on, with a last name like that, of course she had to hire him. 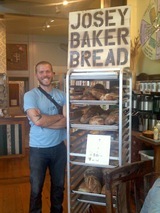 Josey Baker and his bread at Mission Pie (picture from his blog). Don’t be afraid. Really. You’re going to love this. Starting Wednesday May 25th, indie baker Josey Baker (you gotta love this town of baking Bakers) is going to be selling his fresh, warm, delicious bread in Bi-Rite Market every Wednesday and Thursday evening, starting at 5pm. The bread schedule for now will have his black pepper Parmesan and seed feast breads on Wednesdays, and walnut levain and whole wheat levain on Thursdays. He’s going to have SF bike messenger company TCB Courier pedal the bread over from Mission Pie (where Josey is baking it) hot out of the oven to Bi-Rite. Pedal fast, boys! On a blog post, he also alludes to “special treats in store for those who buy these first Bi-Rite breads… you’ll be able to take the bread bag from Bi-Rite and bring it to Mission Pie, where I will trade you for secret treats.” Hmmm. Secret treats. Sounds intriguing. And up in Bernal, Bernalwood alerts us the latest tenant to join the 331 Cortland marketplace is ~ANDA PIROSHKI~, from Muscovite Anna Tvelova. She’ll be selling homestyle and baked piroshki, in flavors like beef, rice, and cheese; cheesy potato and onions; creamy mushrooms and rice; and apple, cranberries, and almonds. Her launch is also May 25th, an auspicious day for bread products in this town. SFoodie mentions soups like borscht and “rassolnik, made with pickles from 331 Cortland neighbor Paulie’s.” 331 Cortland Ave. at Bennington. Yelp photo by Phillip W.
Last week, I mentioned ~OYAJI~ is now serving lunch Wed-Sun, and a star tablehopper reader snagged a lunch menu for me. Items basically include all the things I want to eat all the time: ramen ($8.50); oyako-don ($7), chicken and egg over rice; katsu curry ($7), deep-fried pork cutlet with Japanese curry over rice; and their evil kani cream korrokke ($8), crab and béchamel croquettes. Other choices include tempura, chicken karaage, and more—all come with miso soup and salad, and nothing is over $9. Exterior photo by Craig Lee. Eater caught wind that ~CHEZ SPENCER~ has started serving Sunday brunch, with items like omelet aux fines herbes; poached eggs and steamed asparagus in truffle emulsion; wild mushroom tartine and poached egg; and smoked duck breast à la Lyonnaise with poached egg and lardons. Since they have a full bar, you’ll be able to enjoy cocktails like a classic Corpse Reviver. And it’s one hell of a pretty location. Sundays 11am-4:30pm. James Syhabout (Commis) has opened ~HAWKER FARE~, his casual and affordable 49-seat Asian place in Oakland. On the menu: rice bowls, a whole bunch of them, plus some snacks like green papaya salad and beef salad. Some dishes include a spin on kao mun gai ($9), a classic dish of poached chicken with mung bean sauce, but their version has the tender chicken cooked sous vide. There’s also a 24-hour pork belly over rice, and issan sausage, a spicy pork meatball sausage. You can add a fried farm egg on top of any of the dishes. Chef de cuisine Justin Yu has worked at Momofuku Ssäm Bar, so he’s no stranger to sriracha. For this week only, they are just starting with lunch (11am-6pm), and next week will be Mon-Wed 11am-6pm, Thu-Fri 11am-9:30pm, and Sat 5pm-9:30pm. Hopefully their beer and wine license will be in effect by the time dinner starts next week. Enjoy the hip-hop and kung fu art. Closed Sun. 2300 Webster St. at 23rd St., Oakland, 510-832-8896. Two weeks of construction and many changes later, and ~MANRESA~ in Los Gatos is scheduled to complete its remodel on Wednesday May 18th. The renovations include lots of new things: a new look, new dining areas, a new wine cellar, and a new bar and lounge space with a new cocktail program to match. Chef-proprietor David Kinch worked with Sterry Architecture and Sunnyhills Studio to update the restaurant’s 1940s ranch-style building with a more contemporary (yet still sophisticated) look. The color palette reflects the natural surroundings of the Santa Cruz Mountains and the ocean with earthy tones and cream and maple accents. Guests will enter under a handmade glass chandelier by Berkeley artist Erik Powell and Los Angeles-based Cleveland Art as they head toward the new bar and lounge at the back of the building. The lounge features a backlit bar with alabaster mother-of-pearl backing, and custom seating encompassing the restaurant’s art-inspired curved wall and mosaic fireplace. It’ll be a nice setting to order from the special bar menu and from the new artisan cocktail program from wine director Jeff Bareilles, who will offer classic and contemporary cocktails using ingredients from Love Apple Farm. The bar seats 10. On one side of the bar, the existing dining area has been completely refreshed, and on the other side, a new dining area seats up to 30, including a cream and ebony banquette lining the back wall. The adjacent private dining room seats up to 10. Plus there are four sure-to-be-coveted outdoor seats, and what was formerly the entrance will now be a walk-in wine cellar. Dinner starts 5:30pm Wed-Sat, 5pm Sun. 320 Village Ln., Los Gatos, 408-354-4330. During Bi-Rite’s Spring Wine Blitz (May 19th-22nd), all wines are 20% off when you purchase any 12 or more bottles. The sale includes every wine in the store, and delivery is free in San Francisco! Ready for another round of ~DINE ABOUT TOWN~? Great deals await you starting June 1st through the 15th during the spring session of Dine About Town SF, with over 100 SF Bay Area restos set to serve a two-course lunch menu for $17.95 and/or a three-course dinner menu for $34.95. Check the list of participating restaurants, many of which have been doing this since the first promotion in 2002, places like Ana Mandara, Cliff House, E&O Trading Company, Fringale, Grand Café, and One Market. Newcomers to the first 2011 session included Comstock Saloon, Ducca, Georges, Hana Zen Sushi & Yakitori Bar, Kuleto’s Italian Restaurant, La Terrasse, Marlowe, Mayes, Moussy’s, Ristorante Specchio, Skool, Sociale, and Velvet Room in the Clift Hotel. For the second 2011 session, 16 more restaurants have joined the promotion, and they are Café des Amis, Campton Place, Fior d’Italia, Fresca (Fillmore, Noe Valley, and West Portal locations), La Costanera, Medjool, Mochica, Passion Cafe, Radius, Sens, supperclub, Laurel Court Restaurant and Bar, The Moss Room, and Zingari Ristorante. Also new is the mobile app LiveShare by Cooliris available (free) for iPhone, Android, and Windows Phone 7—use it to share Dine About Town experiences and photos in real-time. You’ll wanna keep in mind that dates and times of participation vary by restaurant. À la carte menus will also be available. Reservations encouraged and available online through OpenTable.com. And here’s one more promotion: American Express cardmembers can earn a $15 statement credit when they dine three or more times during Dine About Town at any participating restaurants and pay with any registered American Express® Card. Cardmembers must first register at www.dineabouttown.com. The Historic Villa at Montalvo Arts Center; from their website. 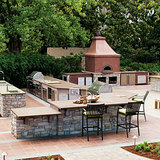 The Sunset Outdoor Kitchen. Photo by Thomas J. Story. Food and wine lovers of the 408, take note: the annual ~MONTALVO FOOD &AMP; WINE CLASSIC VIII: THE ART OF DINING~ has quite the lineup of chefs, restaurants, and wineries this year, and they’re putting together a tasting event on Sunday June 5th, 5:30pm-8:30pm, on the beautiful grounds of the Montalvo Arts Center’s historic Mediterranean-style villa. 20 noteworthy restaurants and food purveyors of Northern California and beyond will be on hand to prepare and serve their unique creations. They include The Ahwahnee in Yosemite National Park, Arcadia (a Michael Mina restaurant), Cascal Restaurant, Chez TJ, Dolce Bella Chocolates and Cafe, Gitane, Junnoon, Kokkari Estiatorio, La Mar Cebichería Peruana, Lafitte, Le Papillon, Madera (Rosewood Sand Hill Hotel), Navio (The Ritz-Carlton, Half Moon Bay), Osteria Coppa, Plumed Horse, Rancho Gordo New World Specialty Food, Sent Sovi, Tell Tale Preserve Company, The Village Pub, and Whole Foods Market (Los Gatos). Winemakers from 20 of the region’s finest wineries will also be on hand to pour tastings: Andrew Geoffrey Vineyards, Big Basin Vineyards, Cooper Garrod Estate Vineyards, Duckhorn, Faust, Fog Crest Vineyard, Goldeneye, Grgich Hills Estate, House Family Winery, Jemrose, J. Lohr Winery, Migration, Morgan Winery, Mountain Winery, Mustard Hill Cellars, Oakville Ranch, Poetic Cellars, Rosati Family Winery, Silver Oak Cellars, Talbott Vineyards, Twomey Cellars, and Ventana/Le Mistral Winery. You’ll have a chance to bid on rare and limited edition wines, and special dining and travel packages during a live and silent auction, which includes vacation packages to South Africa, Bali, Italy, and Mexico! Tickets are $175 ($150 for members), and limited to 425 tickets. All proceeds benefit Montalvo’s art education programs.15400 Montalvo Road, Saratoga, 408-961-5858. A little further up in the 650, Sunset magazine in Menlo Park has announced the headliner for their June 4th-5th ~CELEBRATION WEEKEND 2011: MAKE IT YOUR OWN~: celebrity chef Rick Bayless will be turning up the heat with Mexican-inspired cooking demos on both days, and Traci Des Jardins, Charles Phan, and other notable chefs from the West will also make appearances. Plus, you can easily not just watch, but enjoy the food and drink yourself with the bevy of food trucks and artisanal food, beer, and wine purveyors who will be on-site. It is Sunset’s Celebration Weekend after all, so of course you’ll find DIY demos for home and garden (like beekeeping and beer-brewing), informative wine seminars, gardening exhibits and how-tos, and all sorts of interesting stuff, but let’s get back to the chefs, shall we? Bayless will take to the IKEA® Cooking Stage both Saturday and Sunday from 12:30pm-1:15pm to demonstrate four Mexican-inspired dishes: Mexican-style shrimp cocktail, a summer margarita, sun-dried tomato guacamole, and tropical beach ceviche. Chase Sapphire cardholders get a bonus: they’re invited to join Bayless at an exclusive meet-and-greet in the VIP lounge, and to partake in an invite-only breakfast with the editors of Sunset. In the Safeway Outdoor Kitchen, you’ll find some hometown faves: SF chefs Traci Des Jardins and Charles Phan. Des Jardins will demonstrate warm bread and baby artichoke salad with marinated crescenza (one of my favorite salads) on Saturday from 2pm-2:30pm, followed by Phan from 3pm-3:30pm with caramelized shrimp with lemongrass. See the full lineup here. Gourmet food trucks and artisanal food purveyors in the Artisanal Food Pavilion will include food trucks Babaloo, Chop Soo.ey, Fruit n Exotica, Safeway Ranchers Reserve, Seoul on Wheels, and SPRINKLESMOBILE; and food purveyors Beehive Cheese, Cypress Grove Chevre, Foodzie, Klausesbees, Laloo’s Goat Milk Ice Cream, R & J Toffees, and much more. See the complete schedule of presenters, events, and event information online, and purchase tickets here. General admission $16/day; seniors 60+ $12/day; children 12 and under free (must have ticket in hand). Sunset Headquarters, 80 Willow Rd., Menlo Park. A plate of goodness at Shangri-La Vegan. I’m coming up on week two of my three-week cleanse (eating vegan, organic, and raw as much as possible; no wheat/processed items, no sugar, no caffeine, and no alcohol), and while I am really missing eggs (reason number one why I could never be a vegan), I’m feeling pretty damned good. Nothing like seeing the recent flick Forks Over Knives to really hammer things home about the deleterious health effects from Americans consuming way too much meat and dairy in their diet. Now, I didn’t agree with the film’s usage of quite possibly the worst footage of meat they could find (it looked incredibly unappetizing), and egad, did you really have to show us so much nasty surgery footage? But otherwise, the film makes some really compelling points about the importance of having a plant-based diet. I hope a lot of people see this film—it’ll make you want to make some adjustments in your diet, even if you are eating organic meat. It’s playing at the Bridge on Geary (which dates back to 1939, I love that place)—check it out. Speaking of plant-based living, have you had a chance to check out the newly updated CUESA website? There’s a new Seasonal Foods section, with over 150 new pages where you can learn more about the fruits, vegetables, and other edibles available at the Ferry Plaza, plus learn when things are in season, and get inspired with some recipes. There’s a whole lot more that has been added to the site, check it out. My dining circuit has been mostly about dining at home, but I had a delicious meal at Cha-Ya in the Mission last week (check out my faves on Deep Dishing), and I was happy to visit a friend in the East Bay for lunch, swinging by Shangri-La Vegan (the former Manzanita location on Linden Street) for a bountiful macrobiotic lunch. That place rules. I recommend getting the “full” plate so you can bring home scrumptious leftovers. Three of my favorite things I’ve been eating: the fresh cilantro chutney from Sukhi’s that I picked up at the Ferry Plaza Farmers Market has been a godsend (love it with vegetables over brown rice), the Whole Foods red bell pepper hummus is notably creamy and delicious, and it’s been nice having the quinoa porridge back in my life for breakfast (my latest favorite combo is banana, Artisana coconut butter, and shaved almonds—hubba hubba). Don’t miss out on a chance to sip, sample, taste, and, yes, buy the best food, wine, spirits, beer, and artisan goods produced in Mendocino County. 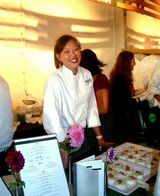 For one night only, on Monday June 13th, 2011 (from 5pm-8pm), the Mendo vibe will be kicking at this marketplace-meets-showcase, Taste of Mendocino, at SF’s Festival Pavilion at Fort Mason. Check out 60+ wineries, one craft distiller, organic beers, artisan olive oil, cheese, and grass-fed beef, lamb, and veal producers, plus the Flynn Flying Circus. The county is coming down to share all that makes for an amazing destination getaway. One lucky tablehopper reader will win a pair of tickets to the event: all you need to do is forward today’s tablehopper newsletter to one friend (but even more would be so very fabulous), then Cc: or Bcc: me at luckyme@tablehopper.com so I know you sent it—I promise I won’t use anyone’s email address. The deadline to enter is Friday May 20th by 11:59pm. I will notify the winner early next week. Good luck! Those who aren’t so lucky can buy tickets here. Tickets are just $35 in advance, $45 at the door. 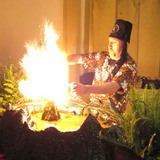 You can find Taste of Mendocino on the web at www.tasteofmendo.com, and on Twitter (#TOM11) and Facebook. All content © 2011 tablehopper, LLC. I am more than happy if you want to link to my reviews and content elsewhere (thanks, glad you dig it), but republishing any part of them in any way, shape or form is strictly prohibited until we talk first. Please take a look at my Creative Commons license for more detail.